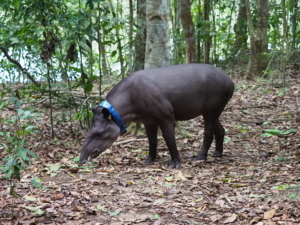 REGUA is very pleased to announce that SavingSpecies, a United States based organisation, helped REGUA to acquire an essential parcel of land to allow us to create a biodiversity corridor. 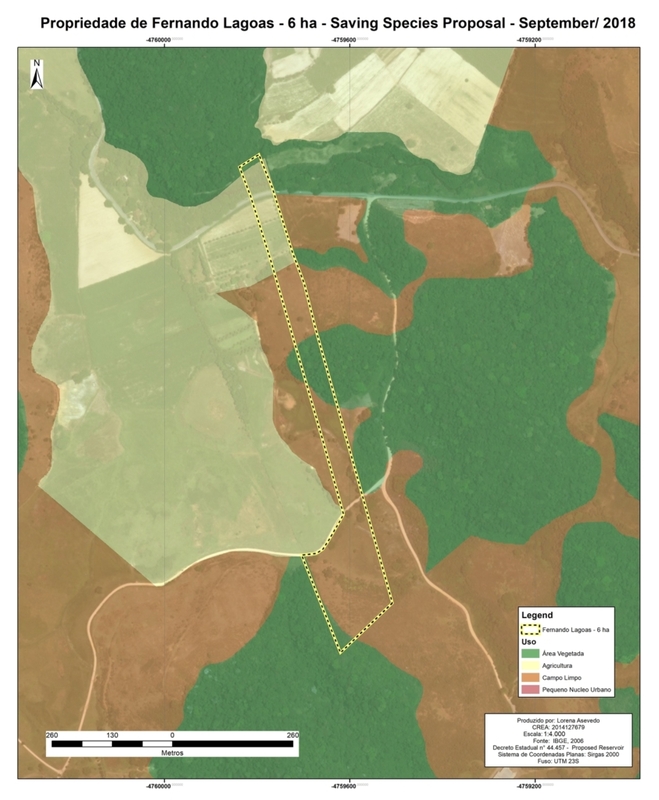 This six hectare plot, located close to REGUA, was essential to connect the 2,500 hectare forested Vecchi ridgeline to the 200 hectare Onofre Cunha land already owned and protected by REGUA. Onofre Cunha will now be connected to the main reserve of 6,700 hectare of REGUA. One can see the strategic importance of this small sliver of land on the map. 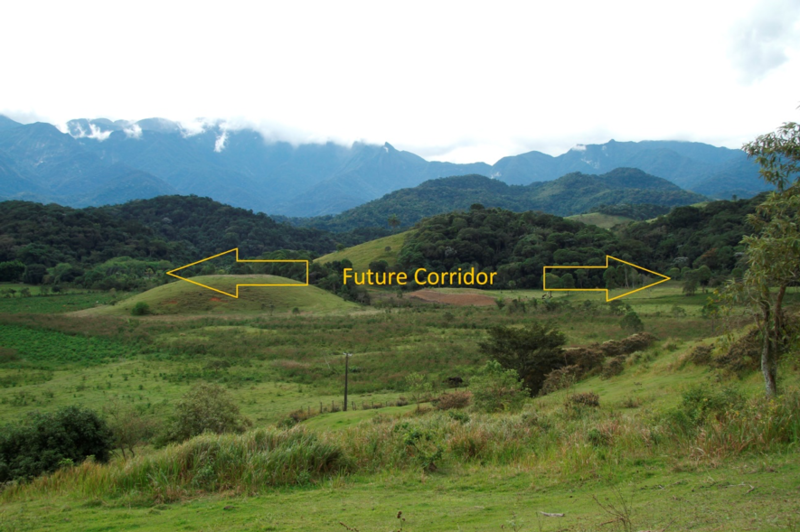 In a short time we will begin to create a forested corridor allowing birds and animals to move through and beyond. SavingSpecies is an environmental organization that looks primarily at building biodiversity corridors as seen with the successful Golden Lion Tamarin project. There, increasing access for these emblematic primates has allowed them to colonise ever greater areas in Silva Jardim, less than 60km away from REGUA. 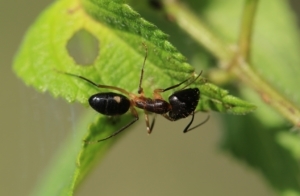 This new purchase, in a mixed landscape with farmland and fragmented forests, the linking of these remnants is really the only hope for gene pools of stranded biodiversity to move around. We are incredibly grateful to Brian and Liz who instantly shared our belief that where there is a will there is a way! Thank you at SavingSpecies, Stuart, Clinton, Erin and all. You show that there is hope and that it is possible to change the world we live in. Russo’s ‘Banana stop’ is back! We are delighted to announce that the Russo’s birdfeeder is back working. Many locals and visitors alike, enjoy stopping at Russo’s makeshift stall on the road to Nova Friburgo. However, following a fire it had been closed for some time. Russo has now, happily, picked up the courage to rebuild and regain his reputation of one the best places to photograph tanagers close up. 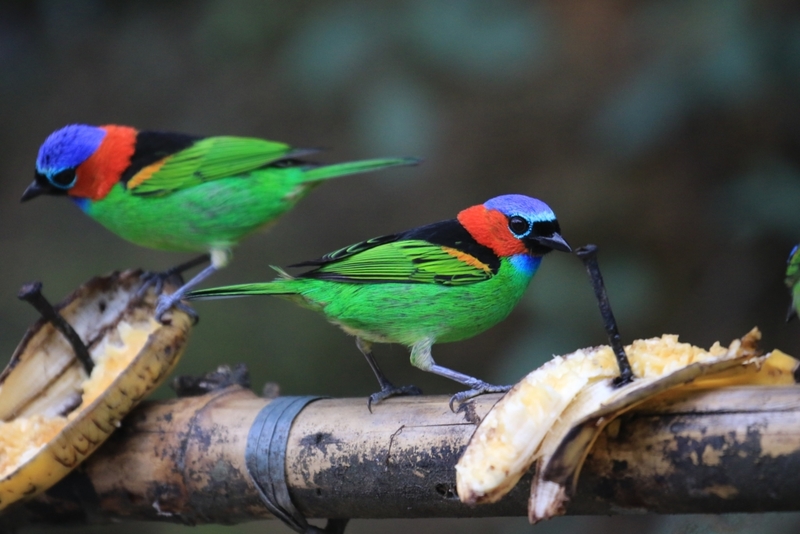 The road works that improved access has helped and today the Russo store, though mainly equipped with bananas, snacks and sweets, offers excellent photo opportunities for Green-headed Tanager, Red-necked Tanager, Azure-shouldered Tanager, Violaceous Euphonia , Green Honeycreeper, Blue-naped Chlorophonia, Ruby-crowned Tanager, Chestnut-bellied Euphonia and even the occasional Spot-billed Toucanet. We always like to stop on our excursions, so be prepared with plenty of memory cards! 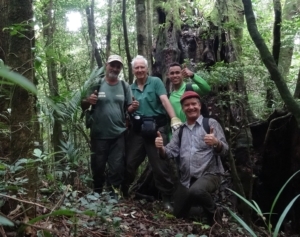 We are so lucky to receive Helmut Seehawer, orchid enthusiast who, together with his close friend David Miller, surveyed the nearby Macae de Cima valley for these extraordinary epiphytes. 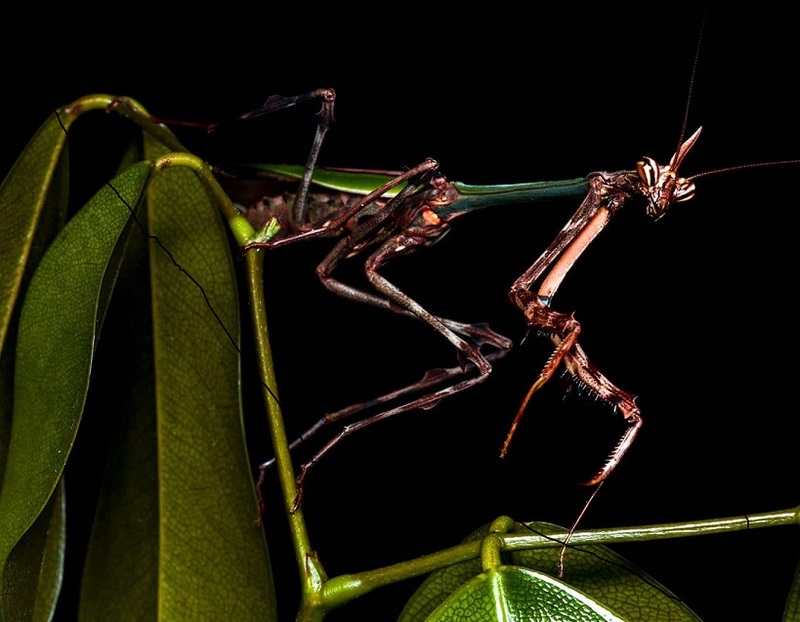 Helmut and David identified and described close to 1,000 species found there and wrote and illustrated the book “Orchids of the Serra dos Órgãos”. Helmut, a retired airplane pilot developed a passion for orchids when he first flew into Rio de Janeiro many years ago and spent a day accompanying fellow crew in another region of Rio looking for these epiphytic plants. What got him hooked were their many different mysterious forms, sizes, colours and shapes which made it a complicated hobby to master. Helmut’s fascination led him to study and survey extensive areas and today he is a recognised authority on their identification. Helmut is 81 years old and has an unassailable passion and energy. 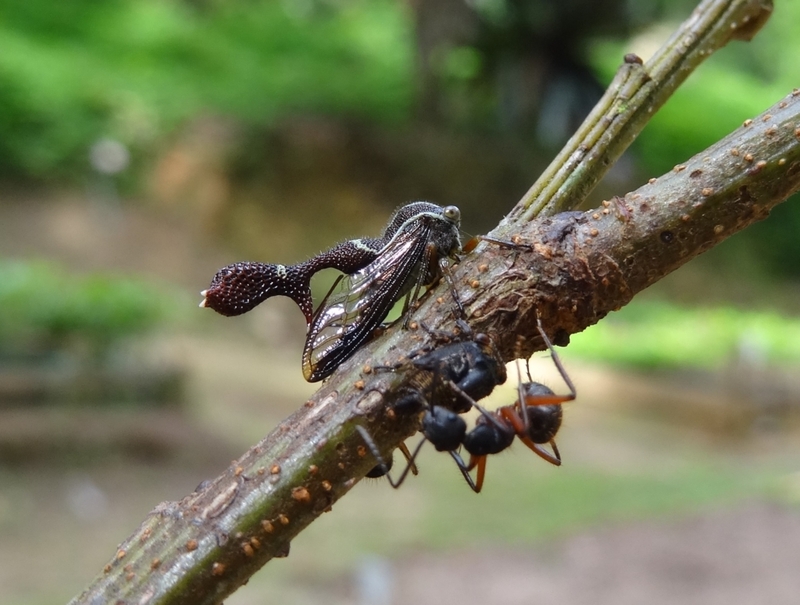 Since his first visit to REGUA he has identified a total of 72 genera comprising 257 species which represent 60% to 70% of known existing orchids. 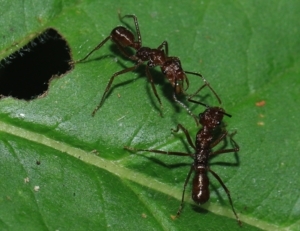 Last October, accompanied by two REGUA rangers, I walked with Helmut to a recently acquired area, the Vidal property on the Serra do Mar ridge-line. The first expedition was a little misty, but with Black-and-Gold Cotinga calling around us we knew were in a special place. The next expedition permitted some mind blowing vistas of the surrounding forest for miles around. Helmut was far too interested in his orchids to notice and he concluded that this rocky high altitude area must be one of the best places he had ever visited. Helmut hopes to return in late May 2019 and we are only too pleased to walk with him, learn from him and share his passion. The REGUA orchid cathedral will be ready to present a sample collection of some of the species found here and draw visitors to appreciate their beauty. Helmut’s enthusiasm and energy encourage us to continue to increase our knowledge and protection of this amazing valley. We look forward to seeing him on more expeditions in the future. 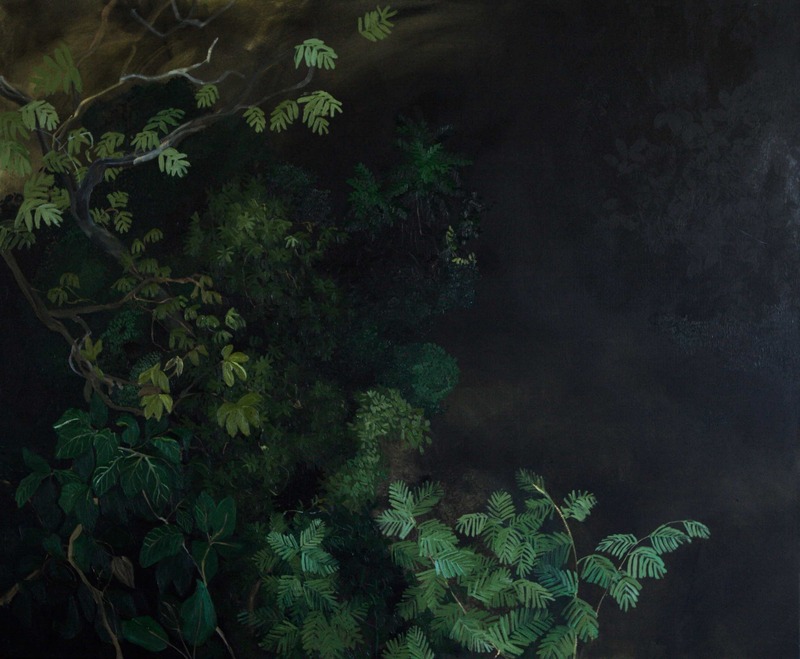 Contemporary British painter Jelly Green has spent the last four years painting rainforests around the world, mainly in central Brazil. Jelly will be showcasing these paintings at an exhibtion in London in April to raise awareness of the devastation that is happening in rainforests worldwide and will also be very generously donating 25% of the exhibition profits to REGUA. For further details check out Jelly’s website. You can also follow her on Instagram. It’s always great to receive our friends and University Professors from Germany, Udo and Dietmar who have always expressed their appreciation and been supportive of REGUA’s work. The University of Leipzig and Cologne, supported by the German Federal Ministry of Education and Research, have been working in the State of Rio de Janeiro for many years. 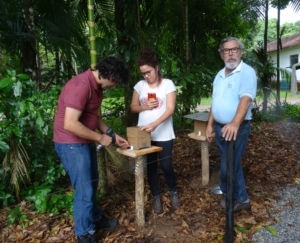 The partnership started in 2005 studying Atlantic Forest fragmentation, landscape ecology and the many biological processes that contribute to soil erosion. They are investigating how to conserve soil and to rehabilitate degraded lands in adverse agricultural systems. 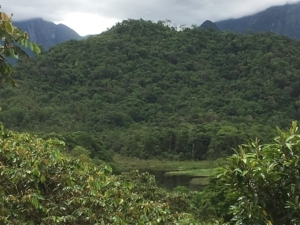 Founder Professor Wilfried Morawetz is no longer with us, but his work helped Jens and Dietmar strive forward to understand the fragile Brazilian Atlantic Forest ecological systems. If not looked after this can have a terrible outcome, such as the dreadful landslides in areas surrounding REGUA in 2011, with much human loss. 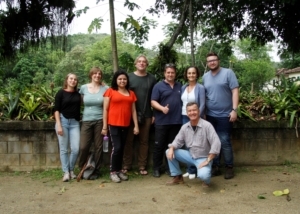 Udo continued with the Brazilian Soil Research Bureau EMBRAPA and brought students to study with fellow Brazilian students to ensure that scientists were aware of the effect of soil degradation on a landscape, and that this can have devastating consequences on the long term. We were pleased that both Udo and Dietmar, both staunch believers in careful soil management and forest restoration who still regularly encourage students to study, could come to see how REGUA has developed and can meet Simone and Antonio Soares Rio de Janeiro State University Professors to discuss tactics, theories and methods. Pictured: Left to right. Students Laura and Zilka, Dr Simone Lisboa (UERJ), Prof. Udo Nehren, Dr Dietmar Sattler, Raquel Locke, Dr Antonio Carlos Oscar (UERJ) and Nicholas Locke in the front.